With the Farmers’ Market open into November, there are plenty of opportunities to create some hearty fall meals using local ingredients. This chicken recipe evokes the classic tastes of fall. Find more Farmers' Market inspired recipes in our Farmers' Market Cookbook! 2. Pour 2 Tbsp. olive oil, red wine vinegar, garlic and herbs over chicken and season with salt and pepper. Set aside to rest and chop vegetables. 3. 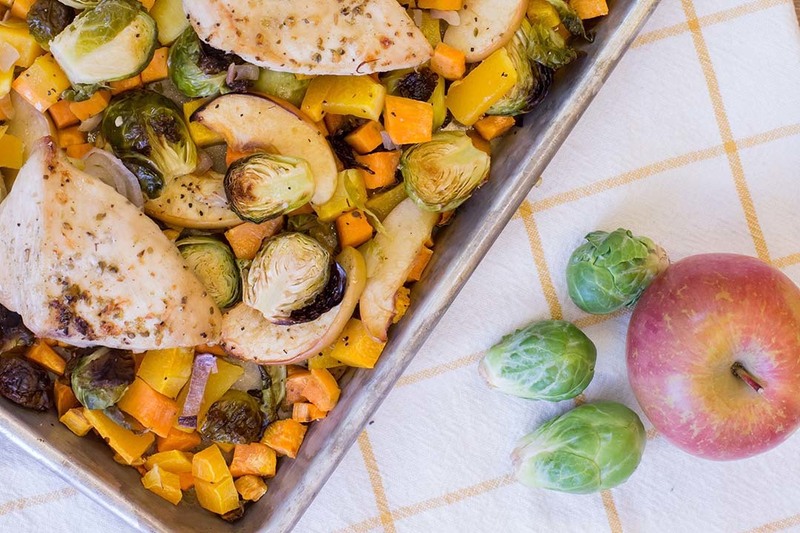 Place sweet potato, Brussels sprouts, apples, shallots and squash on a large rimmed baking sheet. 4. Drizzle with remaining 2 Tbsp. olive oil, then toss to evenly coat and season with salt and pepper to taste. 5. Spread into an even layer, then set chicken over veggie mixture. 6. Roast in preheated oven until chicken and veggies are golden brown, about 25 - 30 minutes (chicken should register 165 in center). 7. Broil during last few minutes for a more golden skin on chicken if desired. 8. Sprinkle with more herbs if desired and serve immediately.